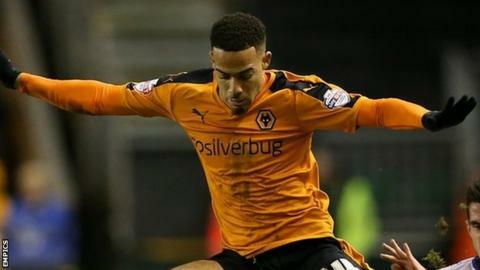 Wolves winger Jordan Graham is expected to be out for at least nine months with torn knee ligaments. Graham, 20, needs surgery after tearing the anterior cruciate and lateral collateral ligaments in his left knee when he fell awkwardly in Saturday's 3-1 home defeat by Cardiff City. "Jordan is expected to be out for between nine and 12 months," said Wolves head coach Kenny Jackett. "But he's young enough and good enough to come back stronger next season." Phil Hayward, the head of Wolves' medical department, added: "He is to see a consultant towards the end of this week. It is probably too early to be talking about exact timescales. "It was one of those almost freakish situations where he was caught slightly off balance and his knee went into a hyper-extended position and that is what did the damage." Graham, signed from Aston Villa in January 2015, has made 12 consecutive appearances for Wolves following his return from a successful loan at League Two side Oxford United. His current 18-month contract is set to expire at the end of the season. Saturday's defeat ended a run of four successive league victories for Jackett's side, halting their climb back up the Championship table. It was also the first game watched by owner Steve Morgan since he resigned as chairman and put the club up for sale on 28 September. Morgan remains insistent that no progress has made on any potential sale. "There's no real update on what's been said in the past," he told BBC Midlands Today. "We're not in firm talks with anybody."